Bookshelf layouts may provide the most railroad fun per square inch or centimeter. example, is my Les Peupliers, described elsewhere on this site, built in Scale 1:32. 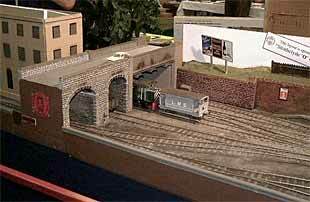 Any of the layouts shown here could also be built in smaller scales, in less space! Places where rails meet the water seem to be natural prototypes for excellent model railways. Here’s one of the simplest possible sites — a “natural” for a shelf layout in almost any scale — Norddeich Mole. Located in the north of Germany on the North Sea, the Mole contains a single spur of level, straight track! Alexander Kaczmarek, who lives in Berlin, took these photos, drew the plan, and sent us some information. “Only one track – no turnouts – and a lot of water…that´s all you need to build the station, Norddeich Mole,” writes Alexander. “Here is the end of the German railroad network at the beginning of the North Sea. 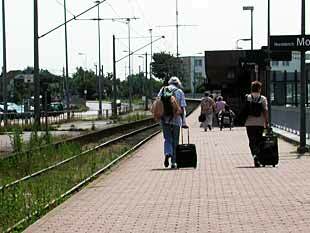 All passengers have to leave the train here and board the ferries to islands like Norderney or Juist. 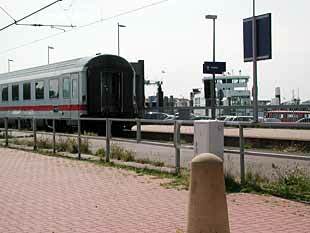 From the nearby station, Norddeich, the loco pushes the train into the single track of Norddeich Mole. Passengers from the ferry enter the train and the loco pulls the train out of the station and vice versa. In Alberta, Canada, Michael Mott is building a completely different type of shelf layout. He writes: “I am working in the weird scale of 30 mm = 1 foot. LGB track (45mm) becomes 18-inch gauge, and 3 foot gauge becomes 90 mm which is the same as 3-1/2-inch gauge, one of the standard gauges for live steam. “I have been building the 3-1/2” in the garden as an out and back. I have also started on an exhibition layout built on three 4×2-ft tables forming a total layout that is 12×4 feet — bigger than 99% of your micro layouts but not bad for a layout using 45mm track and 90mm track gauges. The model will be a combination of a Welsh slate mining operation and an underground tram converging at a loading dock, where the track gauge of 3-1/2 inches represents a three-foot gauge interchange track. 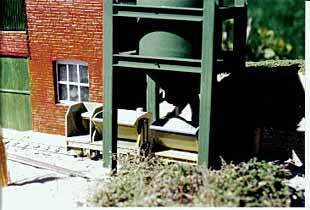 These two photos show early mockups of Michael’s 1:10 scale efforts. The left-hand photo shows two very unusual elements he’s working on: a model of a compressed air loco that was used at a town called Bankside in Alberta, Canada, located in what is now Banff National Park; and a STUB double-slip switch, using Code 330 rail. It actually works! For much more information on this unconventional modeling effort, see Mike’s website. And to whet your appetite, here is one of Mike’s early design concepts for a shelf layout in 1:10 scale. It uses not one but two backstage sector plates, and is made possible by the incredible stub double-slip. Don Coker, from Columbus, Georgia, USA, loves to doodle track plans, and as he’s a professional artist his doodles tend to be both attractive and accurate. Here’s a good example, designed for 7/8in to the foot using a gauge of 1-3/4 in (45 mm) to represent two-foot gauge (60 cm) tracks. Don’s comments on this delightful little shelf switcher (with very large trains! ): “I have been messing around with this notion for some time. It’s certainly not a new, groundbreaking design , just the old ‘sector plate special’ (stole it from your book), but I thought it might work for a switching layout in 7/8n2 with four-wheeled cars and lokey (small equipment). I would love to build it to fit on one wall of my studio but make it portable (on casters) to take to local and regional shows. I think that it would measure about 8×2.5ft (240x75cm). “I would hand-lay the track to fit (assuming that I can find a source for code 250 rail) and with the help of a local friend, build the turnouts to fit the space. I would build very detailed building flats so as not to use up too much space, probably wooden structures from the post-Victorian era… not even sure what the focus of the layout would be yet.” Notice that front and center is a large shade tree, a dramatic Coker speciality! One way of getting large-scale trains in a small space is to use a prototype that is very small with tight-radius curves. 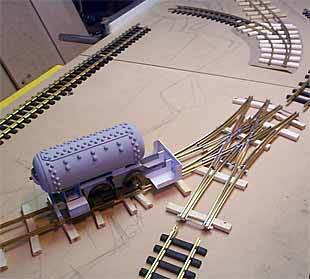 Industrial 15″ gauge trains fill this niche nicely, and Gn15 scale modelers have begun to create some excellently-operating large-scale layouts in very tiny spaces. Chris Peacock, from England, adapted a design from this site to the needs of his Gn15 exhibition layout, Compagne desgravillons et du sable de la Brettone. Chris comments, “The layout was built (but not totally finished) in order to get a modelling bug out of my system. It is based on Ian’s Superior Importsâ found in Carl’s second book (and in this website). I have altered the track geometry a bit to get Peco narrow gauge points to fit (plan at right). “I have altered the rational of the layout, after reading in the Oakwood Press book about Leighton Buzzard Sand Pits; and I have made it a bit more bizarre by moving it to France, hence the name. I just need to get a driver with a beret and a Gauloise hanging from his mouth to finish it off. “The building is inspired by the stables at that previously named location. The hopper is Plustruct, around a cut-down washing-up-liquid (liquid detergent) bottle. There are two engines and four wagons on the layout — some of the stock is from Sidelines kits while the other locomotive is based on an old Tri-ang dock shunter cut up a bit. The wagon is the underframe of a white-metal kit from a Cambrian Oil tank, supplanted with a (real) wood floor. “The layout is operated by a 5 digit, base 6 computing machine — oh, alright then: 5 dice are thrown to determine the train make-up and load. The coloured spots on the first die determine the engine (green or yellow); the second die, the train type, either sand or engineering; then the last three dice determine the wagon order and load. Note that the turntable, which is large enough to hold a complete train of these tiny cars, is removable — so the layout truly can repose on a shelf between operating sessions. 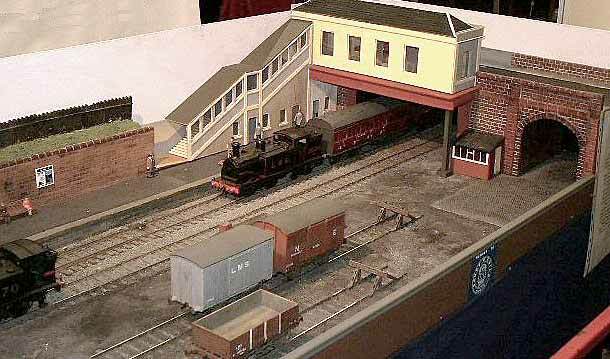 “This layout is a purely fictional O Gauge micro-shunting layout. It is based in an industrial setting somewhere in the United Kingdom and the layout represents a small area of a much larger industrial complex in the 1930’s. 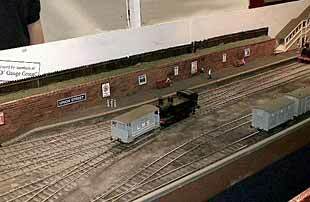 “At the front of the layout is a small loco shed with the usual facilities. The middle siding gives access to the secure part of a Brewery with the back siding used to service the Brewery distribution and engineer’s departments plus wagon storage. “Various short wheelbase industrial locos can be seen with an occasional hired main line locomotive being used. 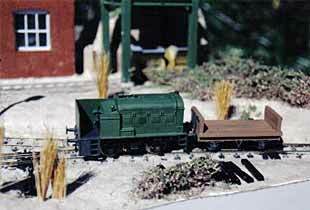 Six wagons are used on the layout plus a loco coal wagon to add nuisance value. “Wagons are selected by the use of dice or cards — two wagons for the middle siding plus one for the back siding are randomly chosen with the loco coal wagon having to be moved to suit. Any new wagon coming into the layout has to be positioned before outgoing wagons are removed. 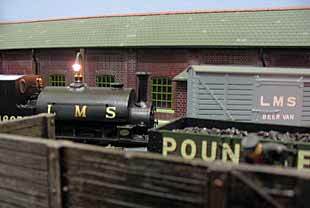 This can provide a lengthy shunting session and allows continual operational interest for such a small layout. “Why Ledsam Street? 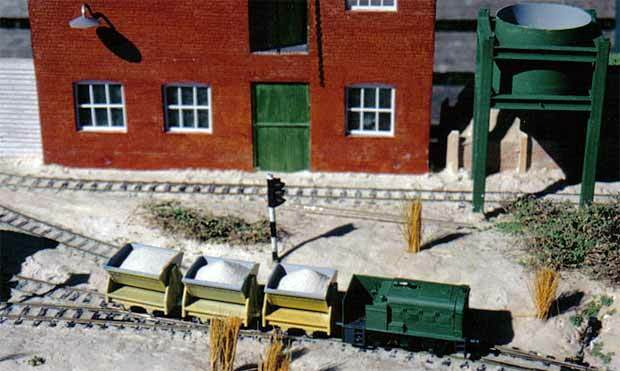 This is the street where the builder was born in a well known railway town and the layout had to be called something. 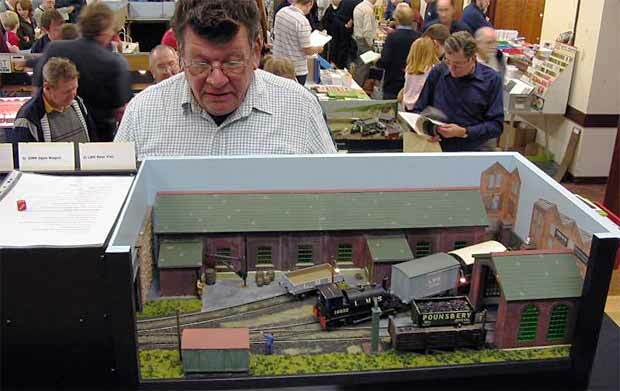 Note; British O models are built to a scale of 1:43.5 for a variety of historical reasons. Track width is the same as for American 1:48 O — 1-1/4in (32 mm). Continental European O uses the same gauge and a scale of 1:45. 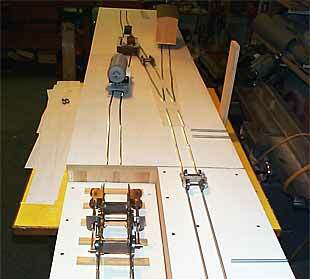 Union Street is an O scale shelf layout being built and operated by the Strathclyde O Gauge Group in Scotland. The concept of the layout is to develop the model while exhibiting it, a ‘show you how’ approach to Gauge O modeling. The compact nature of the layout is deliberate to illustrate that a large scale can be developed for use in a small space and at a reasonable cost.